The above work was published in the September 2002 edition of Electric Radio magazine. This article was to about last May’s AM Special Event in Portland, Maine, but with my recent move to the state, coupled with my search for a new business the writing was pushed to the back shelf. So when I contacted Barry a few weeks ago I offered a new twist, rather than just tell you about all the fun we had with the station, I wanted to exhort you to set up your own AM Special Event station, and in the process share some of my trials and tribulations, on how to go about getting your station on the air. The first question you might ask is “Why set up an AM Special Event Station in the first place?” Which, after working on several of these events, from the Dayton Hamvention to the Buffalo Hamfest, I often ask myself. Why lug a couple hundred pounds of quite valuable gear out of your basement, wrangle with the hamfest committee over operation and placement, round up your contingent of operators, and spend less time operating than setting up the station? Why indeed! The answer is rather simple, because it’s worth it. Sure we can operate from the comfort of our hamshacks at any time, but if you do that you are missing fully half of the fun of this hobby. You see, radio is about people, radio isn’t just about vacuum tubes, feedlines and SWR. Radio is also about people, their lives, hobbies, and passions. And no mode portrays the richness of the human experience like AM. Alright, I’m biased. I like Amplitude Modulation, in fact like may be too light of a word for it, I am in awe of AM. I have found time and time again that there is no finer mode to bring in listeners like the rich, full sound of AM. I see it time and time again when we run one of these stations, a small crowd will gather around the speaker, listening to our operator hold forth with another station. I can divide this group into two distinct subgroups, those new to the hobby, and those who once ran AM but left the mode decades ago. The first step to getting a special event station off the ground is get approval from the club hosting the hamfest. Assuming you want to run the station at a hamfest, for nothing prevents you from making your own event, setting your station up for a local Boy Scout troop, church group, or in the neighborhood shopping mall. In fact, as you would not be “preaching to the choir”, it could be argued that these places might be even more effective than a hamfest. But for sake of argument let’s assume you are now trying to justify your stations existence to a local hamfest committee. The first objection to come up will almost invariably be the concern of RFI to the public address system. Safety, too much power consumption or not enough space are usually next on the list. You can easily handle these objections by having a prepared station layout; photos are idea for this, showing antenna position, power consumption, and RF output. I used to lug the T368 around to fests, but after suffering a hernia –really, I have found that DX-100 power, anything over 100 watts is more than enough to make excellent contacts if the bands are in good shape and the antenna efficient. 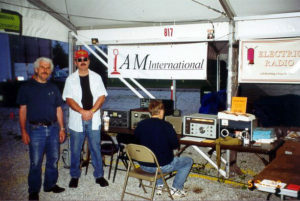 Our station at Dayton in 2000 was only a DX-100 transmitter and NC-300 receiver, coupled to a dipole fed with balanced line. The entire station, along with AMI and Electric Radio information, fit on a 24” x 36” folding table and while transmitting used well under 20 amps of current. It’s hard to object to a station of that size using that moderate level of power. If you can, bring along a decent external speaker, nothing will draw in passersby like a large public address speaker, at a moderate audio level, reproducing the rich fullness of the AM signal. Time and time again onlookers have been amazed at how good the audio can sound when it is not exiting via the 3” speaker in their solid state rig. Once you have the official thumbs up it is now time to scout out venue well before the operating day. All hamfests are not created equal and it is important to inspect the site for any “skyhooks” to use for antenna supports, power lines to be avoided, and a spot out of the sun to place your station. The obvious safety concerns of feedline placement distance for power lines and such apply, just use common sense. Make a written list of extension cables, coax, antenna supports, and other gear. Such a list assures you a quick station set up on the hamfest morning with a manual of headaches. Now the easy part. Recruit your help. The effort to set up and operate a successful Special Event station can simple with the right help. I have been fortunate to always find a good number of volunteers who cheerfully chip in to set up and operate the station. Assign two teams, one for setup and breakdown at the end of the event, and another team to operate during the hamfest. I find that I am often too tired to do much operating after night and early morning setup project. Most hamfests last 4-5 hours, so be sure to have at least 3-4 ops to keep the station on the air, allowing everyone to get his or her turn at the coffee, donuts and other hamfest goodies. I won’t enter into the debate of the “channel” AM operation, but it is important to operate near one of the key AM “windows”. Allow yourself some space, say 10kc as not to interfere with adjacent QSOs. I have found, the hours of the typically hamfest, the 75 and 40 meter bands are ideal. 3.875 and 7.280MC are idea frequencies for your station. Close enough to the AM window to be found easily, but separated by enough space so as not to cause QRM. Plan for QRM, like it or not, it does happen. Try to find someone with a high power station to act as the “Channel Master” or anchor station and keep the frequency open. It is a good plan to have your QRO station come on at least ½ hour before your station formally goes on the air. If you can, have some, coffee and donuts waiting for your crew when they arrive to set up the station. Be sure to allow plenty of time for antenna and power supply issues. Once you get on the air, or as we say here in Maine, on the “ayah”, log, log, log. Keep a written log of your contacts; make some notes on each QSO for later reference. Think about your audience, and remember, many of your observers will just be familiar with the standard banter of 2 meter FM, or the quick signal exchanges of DXing, so try to get a fast paced roundtable going. Make notes of the other stations configuration, how long have they been licensed, antenna layout and such go a long way toward showcasing the relaxed mode of AM for those listening in. Be sure to invite the now gathering crowd to actually operate the station. This tax your persuasive powers for often times your audience will be mic shy. If you find this the case, gently coax and offer them a few questions to ask the op on the other end. If you are lucky enough to have an YL observing, be sure to invite her to operate. Nothing creates a pileup quicker than a female voice. Explain to how to tune the transmitter, how to zero beat the receiver, which may be terms and concepts new to many of your observers. I find it helpful to have handouts at the station. The AMI brochure (contact Dale KW1I for this) or WB3HUZ’s explanation of how to properly run AM on a solid state rig is very good, as are the URLs of various AM and vintage gear websites. You might want to contact Barry to obtain some issues of Electric Radio to sell, and don’t forget the ARRL. The League, which after all exists to promote radio, is an excellent source of many free pamphlets regarding the radio hobby. Radio parts, old tubes, variable caps, inductors, old QSTs, which many of us have in abundance, are excellent props to have on hand. Show the crowd what a vacuum tube really looks like. If you can, bring in a homebrew transmitter or receiver to show the crowd. People are fascinated when they can see and understand how a radio really works. Today’s equipment, as compact and versatile as it may be, lacks the charisma and “soul” that a nice old tube set has. Open the top of the reviver and transmitter and let your observers see the inside of the radio, the glow of the vacuum tubes, and the purple glow of the 866s. I will wager you that the “ohh” and “ahh” factor will far exceed what you will receive from the stations solid state cousins. If you can, have a small notebook where your crew and spectators can sign in with their name, call and email address. Such a guestbook is very helpful for developing next year’s operation, and provides the hamfest hosts of the station traffic. Keep in mind our three goals; the first is simply to have fun. Lets face it, as magnanimous as it is to want to introduce newcomers to the joys of vintage gear; you are never going to want to make the effort to set up the station again unless you and the other ops enjoy themselves. Our second goal, to borrow a phrase is to be an “AM Ambassador”. This is something that we hopefully practice anytime we are on the air, but at no time is it more important that when operating a high profile Special Event station. Be courteous to those calling in, try to have short chats rather than just callsign exchanges, ask about their station, years licensed and then be sure to thank them for checking in. If you are able to get a roundtable QSO going so much the better, such dialogue really showcases the best of AM operation. Our last goal, and perhaps most important, is to introduce newcomers to the hobby, and to remind those older ops of the pleasures of operating vintage gear. There is nothing like having an old timer sit down and explain his amazement that AM is still around and relate his experiences homebrewing in the 30s and 40s. Or the new ham, armed only with an HT, which is magically drawn to radios that glow in the dark. Get ready for converts and to hear many memorable stories. Once your operation is done, the equipment packed away, be sure to thank your hamfest hosts for the space. Chances are your hosts are going to be pleasantly surprised at the turnout and crowd your small station drew. But just in case, be ready to address any concerns that they might have while mentioning that you would like to meet soon to begin planning next year’s station. Next take your crew of ops, and be sure to invite any new converts, out for lunch and some well deserved cold 807s. This is an excellent time to critique the operation, discuss next year’s station and initiate the newcomers in the world of glow in the dark radios. Everyone loves to look at photos of the latest hamfest event, so be sure to bring along your camera. Digital cameras are excellent for the ease of putting these photos up on the web. Do your best to shoot a group photo in front of the station, and send off a copy to your crew, aside from reminding you how much fun you had, it will go a long way to rounding up help for next years event. If you can, scan in your logbook and put it up on the web. Or if you manage to find some very patient and considerate soul, you could even design and mail out your own QSL cards for the event. I still have the very attractive Dayton QSL card that KW1I designed a few years back. When all this is done, give yourself a good pat on the back. Setting up such a station is not an easy task, but take heart, it does get easier and more enjoyable each time. Know that while you are providing a fun morning diversion for you and your ham buddies, you are also doing a great service for the hobby. 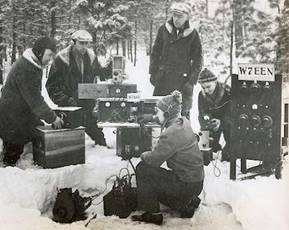 Your station can demonstrate the magic of radio to a prospective ham, enrich the radio experience for newcomers, provide an impetus to get back on the air for the inactive, trigger some fond memories in our older hams, and end up costing you no more than a few cold beers. I would say that is bargain indeed!